In 1961, former president Harry S. Truman sat for a lengthy interview with TV journalist David Susskind. He had been out of the office for a little more than eight years, working hard to establish his presidential library in Independence, Missouri. The 77-year-old Truman gave a thoughtful, genial interview, offering commentary on then-current politics and political figures. This interview makes up the bulk of Give ’em Hell Harry, and while he can hardly be accused of giving anyone too much hell during the chat, he does offer some interesting observations. President Truman expresses great faith in the youth, saying repeatedly that they are eager to learn about and participate in American democracy. What he made of the youth movements that swept the country half a decade later is an open question, but he was right to note that the young wanted to be part of the discussion. While Susskind’s interview is of value largely as a time capsule, the second portion of the film–a 1974 interview with Truman biographer Merle Miller and producer Robert Alan Aurthur–is deeply fascinating. Miller, Aurthur, and Susskind had filmed material for a television series about the former president around the time of the initial interview. Here, two years after Truman’s death, they share personal stories about the man as they knew him. Harry Truman, whatever you think of his policies (or the fact that he seems to have disliked dogs), was unquestionably a consequential President. He ended World War II, helped rebuild Europe, and integrated the military. In his post-political career, he maintained his integrity, refusing to cash in on the office he had served. Give ‘me Hell, Harry is a fine testament to that period of his life, and is of great value to presidential historians. Margaret Truman with Mike, who stayed only briefly at the White House. 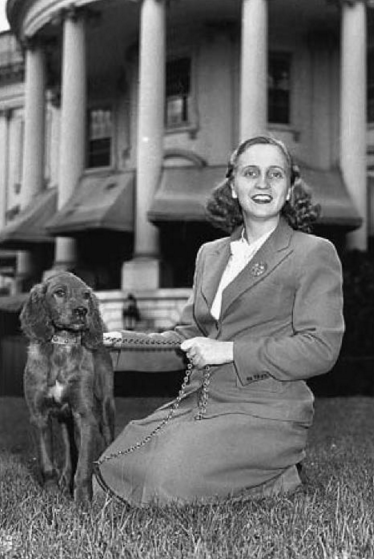 In May 1945, about a month after President Harry S. Truman was sworn in, Postmaster General Robert Hannegan gave Truman’s daughter, Margaret, an Irish setter puppy. The puppy, whom the 21-year-old Margaret named Mike, spent the summer of 1945 at the Truman home in Independence, Missouri, rather than at the White House. Unfortunately, Mike developed rickets. According to several sources, the dog’s health suffered as a result of all the scraps he received as treats from staff members. The Trumans gave Mike to a farmer in Virginia, where they hoped the dog could be more comfortable (and be fed fewer scraps). Later, President Truman himself received a dog as a gift. Feller, as the cute cocker spaniel puppy was known, became the source of controversy when Truman quickly gave him away. Truman was many things — but a dog lover certainly wasn’t one of them. You can read more about Feller here. Some people attribute the quote “If you want a friend in Washington, get a dog” to our 33rd President Harry S. Truman. However, he probably didn’t really say that — and if so, Truman certainly wasn’t very good at following his own advice. 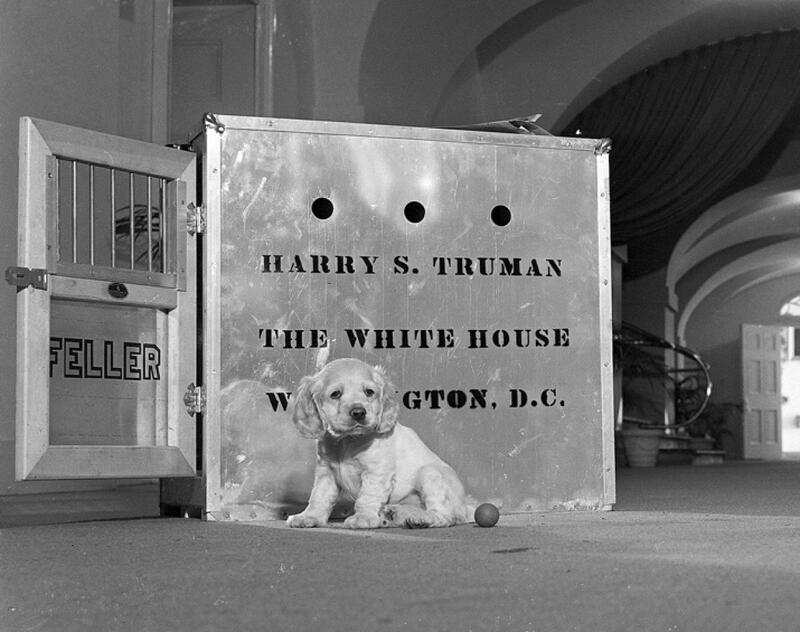 President Truman, who took over the Oval Office in 1945 after the death of Franklin D. Roosevelt during FDR’s fourth term, came to Washington, D.C., from Missouri dogless. Almost three years later, Truman angered dog lovers all across the country when he gave away a dog that a supporter had sent him. A woman from his home state of Missouri sent him a cocker spaniel puppy named Feller, but Truman gave Feller away to his personal physician. “Thousands [of angry Americans] wrote letters to the president,” according to a Newseum exhibit on presidential pets. “Feller, the puppy,” said the reporter. “Oh, he’s around,” Truman replied. Feller eventually wound up at a farm in Ohio, where he lived happily for many years until he died of old age. “I didn’t ask for him, and I don’t need him,” Truman said, according to Coren. The reader should note that every U.S. president since Truman has had — and quite enjoyed having — a dog at the White House.